I have heard the hosts of Audio Theatre Central review a couple of Colonial Radio Theatre's productions in the past, but had never heard any for myself. However, when I found that CRT was dramatizing the Tom Swift series and a certain person was composing the music for it, I decided to make this my first listen to one of their radio dramas. 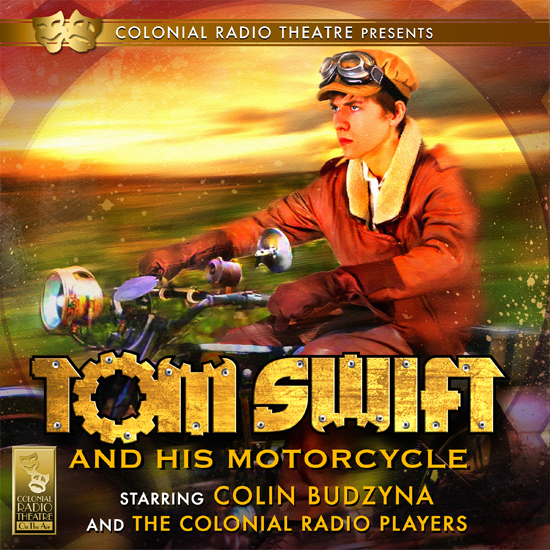 Tom Swift and His Motorcycle is a dramatization of the first book in the Tom Swift series; a series about a young boy inventor and his adventures. The book was first published in 1910. The summary of the story is as follows from CRT's website. 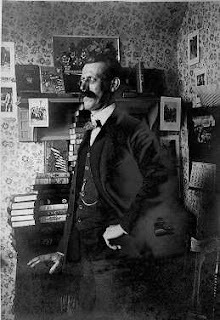 The Tom Swift series was created by Edward Stratemeyer and published under the pen name, Victor Appleton. Stratemeyer also created the iconic characters of Nancy Drew and the Hardy Boys. I grew up reading the Hardy Boys and Nancy Drew books (and still do! ), but had never read any of Stratemeyer's other works. I did read 2 books of the rebooted Tom Swift series from the 90s, but that was it. The ones that I read were much like the other action-oriented tween/teen books of its time. However, the original series was more subdued. The later novels were much more sci-fi driven, but this one is more along the lines of the mystery adventures of the aforementioned series. The only big difference (at least in this book) from Stratemeyer's more famous series is that the main character, Tom, does a lot of fixing of different machines in unique ways. Sort of like a young, early-1900s MacGyver. In later books, Tom does more actual inventing. The story goes along at a good pace with plenty of humorous bits and action. The pacing of the story really shows the kind of storytelling that was popular during the time period this was written. It was a little like an interactive history lesson as you hear about the kinds of transportation that was just becoming popular and the certain way people talked. The ending was a little unexpected and kept you guessing. It also sets up the next book, Tom Swift And His Motor Boat. Just a quick disclaimer: As this is a secular story, there are certain slang words that were said in the book that were used in the drama. There was nothing harsh and nothing that you wouldn't find in early Disney cartoons or young people's books from the early 1900s. After hearing this drama for the first time, I started to read the book it was based on to see how much they varied from each other. I was surprised to find that the radio drama is almost identical to the book, in terms of dialogue. For example, there were some parts in the drama where characters think out loud quite a bit and say what is going on around them. There was no narrator used, so I thought that this was just a way for the adapters of the book to tell what was going on because it was an audio drama. After reading a good portion of the book, I found out that this is just how it is in the original text, so the writers just used what was already there. For purists who like adaptations to be close to the source material, you'll be quite pleased with it. I have yet to finish the book, but I've heard that the writers of this production have intentionally taken this approach to adaptation. Kudos to them! The main reason I bought this particular production was to hear the music in it. That's because the music for this story was composed by, possibly my favorite music composer ever, Jared DePasquale. This is his first time to do music for Colonial Radio Theatre. I was excited to hear that he will be composing more music for them in future productions. I enjoyed the whole story, but the true star of this drama was his score. It's whimsical, adventurous, and helps bring the listener into the time period of the story. Like any of Jared's work, they are wonderful to listen to in or out of the story. I did some homework recently and listened to some of the cues from the drama on Jared DePasquale's website. Great brain stimulus! The only major problem I had with this production was some less-than-perfect audio levels. The music overpowered some of the dialogue in a couple of places, specifically at a point where there was a lot of action happening during a chase scene. However, through the vast majority of the drama, it was back to normal. 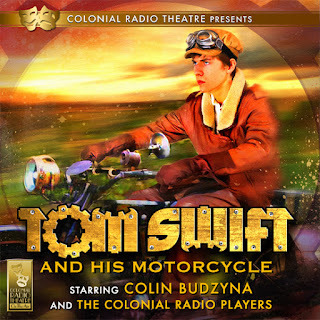 As for the acting, Colin Budzyna (who also plays '66 in Jimmy and the Star Angel) is the perfect person to play Tom Swift. He does a great job carrying the show. There is quite a bit of humor to be found in this show thanks to some really fun characters in the forms of Mr. Wakefield Damon and Eradicate. Mr. Damon (played by Lincoln Clark) is an overdramatic person who is fond of using variations of the phrase “Bless my hatband” or “Bless my liver” quite often. There are some really funny lines that he delivers. 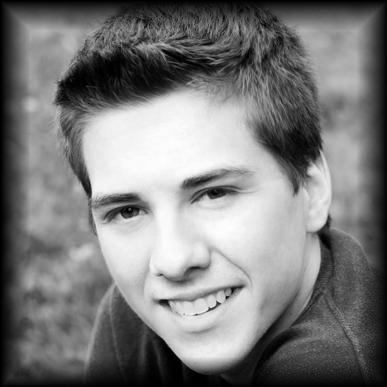 Another standout performance was Joseph Zamparelli who played Eradicate Andrew Jackson Abraham Lincoln Sampson, Eradicate Sampson for short, or Rad for even shorter. He and his mule Boomerang are great comic relief and play a major part in helping Tom Swift in his adventure. The only lackluster acting came the actors who played the bad guys. Some of the lines were delivered kind of flat and didn't sound very menacing. Thankfully, they are only in a few scenes. The sound effects were well done. They're not on the high level of Adventures in Odyssey or The Extraordinary Adventures of G.A. Henty, but they don't need to be. There are enough sound effects and music (especially the music) to draw you in and the story is more than adequate to hold your attention. If you've listened to Your Story Hour, you'll know what I mean. Overall, this was a fun and exciting ride (pun intended). It was a great introduction for me to CRT's works. After hearing this, I'm looking forward to hearing more productions from CRT and their next Tom Swift dramatization (which is set to come out early of next year). 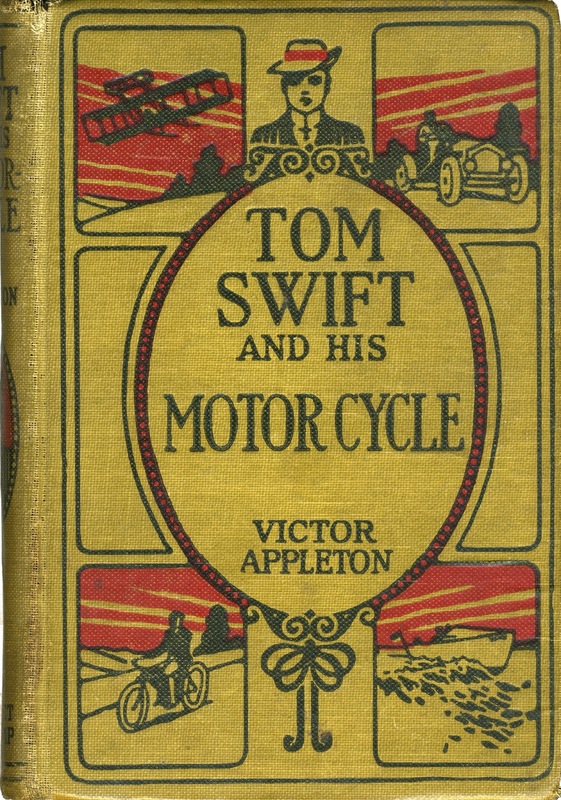 I'd give Tom Swift and His Motorcycle 4 stars out of 5. I'd definitely recommend it to people who enjoy Nancy Drew and the Hardy Boys and, of course, to anyone who likes radio drama. You can get your copy through one of our partners below. Thanks! Austin Peachey is a die-hard reader and audio drama fan. He's run the Adventures in Odyssey Blog for over 8 years and has produced a few audio dramas of his own. He's also worked on the 2nd edition of The Official Guide to Odyssey and can be heard on Iliad House.